Last week while sitting in my room working on a seed bead amulet bag, I heard the Weather Channel announce a fast moving storm front in Louisiana. Last week while sitting in my craft room working on a seed bead amulet bag, I heard the Weather Channel announce a fast moving storm front that was currently in Louisiana. The rain had made Mardi Gras partying in New Orleans a bit of a challenge. The weather map displayed a long line of green and red colors superimposed over the SE portion of the country, indicating Pensacola was probably going to have some rain and possibly hail, thunder and lightening. As the morning progressed it soon became apparent this was not “just” a minor storm. The word “tornados”, plural, kept coming up in the forecaster’s conversation. I only had one wish. Please let me finish my seed bead project before the worst of the storm. No way was I going to die before I finished this project that has taken me a month to finish. The dogs were nestled in their crates, giving me no indication of any thunder, lightening or barometer changes. Around 9:30 a.m. the cat gave out a loud yowl, a sound like a long drawn out, “Rrrwwooow”, that would have made a Siamese cat proud. Roughly translated, my cat said, “Danger, Will Rogers! Danger, Danger”. She then went into hiding. There was still no confirmation from the canine pair. They slept soundly in their crates. What always scares me at the beginning of a storm is the initial dark black sky with gnarly grey clouds. This is it. If something bad is going to happen we’ll know soon enough. But that storm eventually passed. It was bad, but no damage was done to the house nor were there any trees down or even bad wind. The TV announced tornados had touched down in the vicinity though, with one ripping through a gas station in nearby Mobile. I continued with my beading project only to hear on the Weather Channel that the back edge of the storm was going to possibly bring more rain, hail and tornados. This time River started furiously barking and scratching in his crate. Afraid he might hurt him self, I sat down on the floor next to his crate with a book and my Blackberry. Checking the local TV channel afterwards I found out more tornados had come down southeast and north of us but again we were safe in Pensacola. The dogs slept well last night, exhausted from the terrible rumbling of thunder that shook the frame of the house. There was one major impact from the storm though. Apparently it blew out my computer’s modem. Or that is the assumption, since my computer works well at my computer guru’s house. Harvey came over here and checked the network lines (there are three computers in our house). Finally a call to AT&T’s tech department determined it is either a modem problem or a “filter” problem. The filter is one of those little five inch plug in connectors between the phone line and phone. It allows us to have Internet and phone data coming in to the right place or something like that. Anyhow, the filters are cheap and even I can replace them. It remains to be seen if I can figure out how to reconfigure the new modem to the router and computers. Ick. I’m out of my comfort zone again. Thank goodness Harvey is only a phone call away! The following day it was cool, sunny and windy. My tracking plans that were postponed were back on again. Levi did a stellar job, tracking nine straight line tracks into the wind, 20-40-80 steps. A field trainer asked politely when I would be finished with the field. We never introduced ourselves but watched each other train our dogs in different venues. Meanwhile River was barking furiously in my car. How dare I not track him too! Looking around the huge fields I decided to start his track in the RV parking area, a partially grass covered and graveled area. 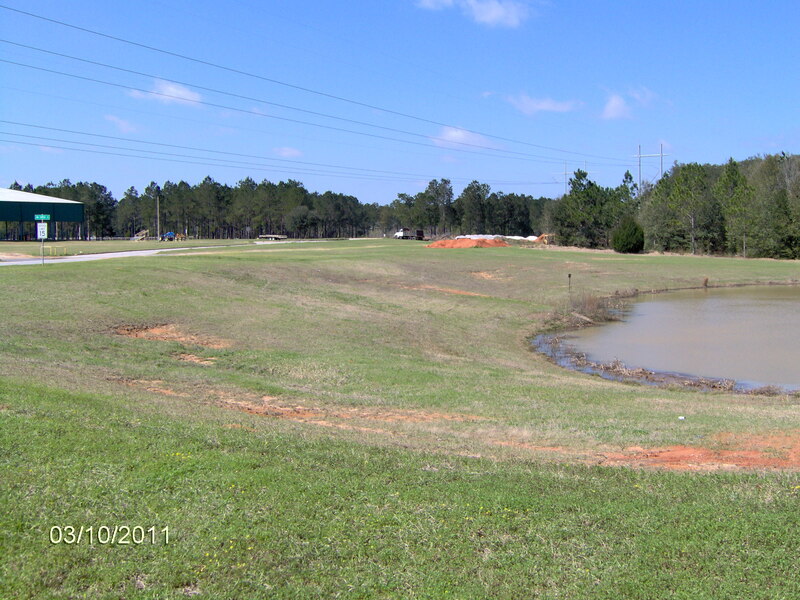 The track would then take an angled turn down to the left toward a pond, then return uphill to a distant pile of dirt, turn left and finally end about 50 yards to the right. River had a hard time starting in the RV area. Too many gasoline smells? He easily tracked across the gravel and down toward the pond, indicating the angled turn with no circling. But when he got down toward the pond and was turning back up the hill he obviously had problems. The wind from the northwest was blowing my scent back down toward the pond. 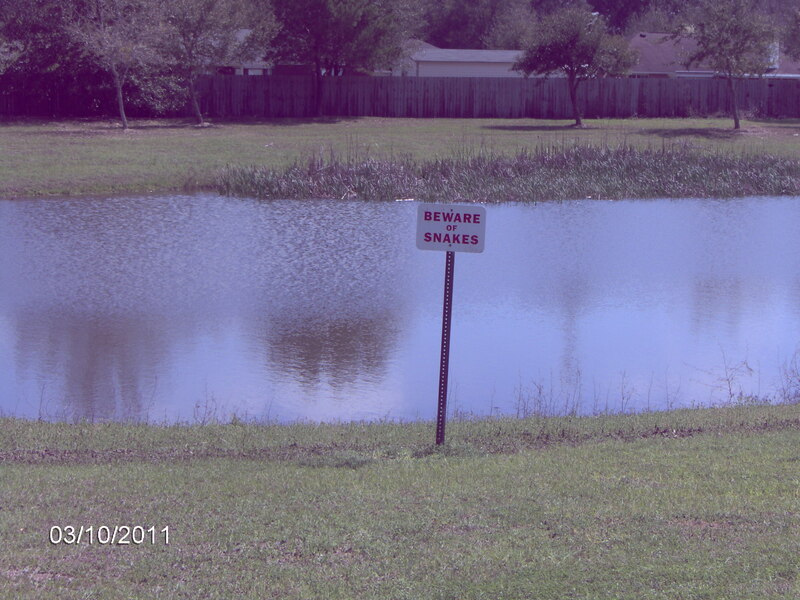 Yes, the pond where the sign says, “Beware of Snakes”. To quote Harrison Ford in Raiders of the Lost Ark, “I hate snakes!” I held my ground, said, “Leave it”, backed up and helped him work himself over toward the hill away from the pond. He figured it out finally and finished the last two turns to his glove. Unlike Levi, he doesn’t go nuts with the glove. He wags his tail, flaps the glove around for a bit, carries it a few steps and then drops it. His job was done. River has been tracking since he was about nine weeks old. He will be eleven years old in June. Somewhere in my file is an old picture of him when he first learned to track, wearing his tiny harness, with a big glove on the ground next to him. Tracking is something he loves. No way will he ever let me leave him in the car while I train Levi, not without a major canine temper tantrum. Not a problem River. I’ll try to “lose” more gloves and maybe some plastic and cloth items too. Just stay away from those snakes! This entry was posted in border collies, Cats, Dog training, Retirement Life and tagged beading, Border Collie, Cats, Weather Channel. Bookmark the permalink.